FEATURE ARTICLE: A Holistic Approach for Corrosion Control by David Simpson. For many engineers and owners facing rising costs and disruption due to maintenance and concrete corrosion repair, there is a financial incentive to preserve and extend the life of existing concrete structures from future corrosion damage. Preserving large concrete structures such as bridges, parking garages, and marine piers is also a sustainable practice with environmental and public benefits. A major contributor to concrete deterioration is corrosion of embedded metals. In particular, corrosion of reinforcing steel, corrosion of epoxy coated steel, and corrosion of prestressed concrete when unchecked can eventually lead to major rehabilitation costs or structure replacement. Cathodic protection is a proven solution to make new and existing structures last longer. Concrete repair alone is not a long–term solution when corrosion is the source of the deterioration. After repairing corrosion–induced spalls and delaminations, there will likely still be chloride–contaminated concrete surrounding the rebar in areas adjacent to the chloride–free patch repair. Unfortunately, this situation can lead to the initiation of secondary corrosion sites in areas around the repair. To provide a longer–term solution, there are various cathodic protection methods available. All of the systems are similar in that they deliver a protective current to the reinforcing steel but have different advantages and uses. 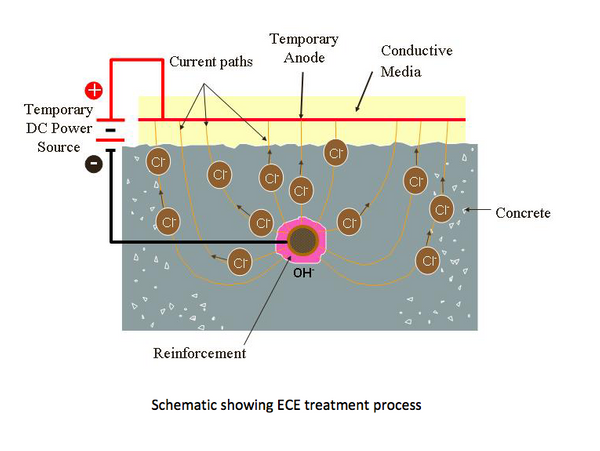 Schematic showing ECE treatment process (click to enlarge). These systems address the underlying cause of corrosion by applying a temporary electric field to the structure. Electrochemical Chloride Extraction is used to reduce chloride contamination and passivate active corrosion. Realkalization is used to increase the pH of carbonated structures and passivate active corrosion. Both systems are applied to a structure on a short–term basis but produce long–term results. Click here for more information about Norcure® Chloride Extraction, a proven ECU method. Schematic showing ICCP installation process using discrete anodes (click to enlarge). Impressed current cathodic protection (ICCP) systems are designed by qualified and experienced National Association of Corrosion Engineers (NACE) CP4 Cathodic Protection Specialists or The Institute of Corrosion (ICorr) CP Level 3 Senior Cathodic Protection Engineer. ICCP systems consist of permanent inert galvanic anodes, such as MMO titanium mesh and ribbon, conductive ceramics or conductive coatings and an external DC power source to supply sufficient current is delivered to the steel to overcome the natural concrete corrosion activity. Galvanic protection systems utilize galvanic anodes which are metals with sufficient voltage difference with respect to the corroding steel that protective current will be discharged from the anode though the environment to the corroding structure. Discrete galvanic anode installation mitigates secondary corrosion (click to enlarge). Typically, in concrete repair or concrete restoration applications, various types of zinc anodes are used. As the zinc anode corrodes, it generates an electrical current to mitigate corrosion of the reinforcing steel. Distributed anode systems for concrete corrosion control generally consist of galvanic anode(s) that are placed over a wide area. Examples of distributed galvanic systems include zinc metalizing and expanded zinc mesh. 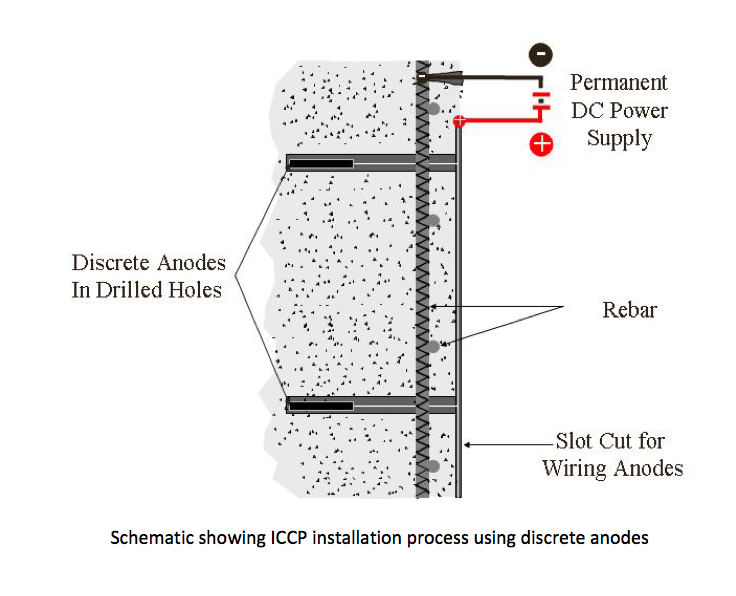 Discrete anodes are individually tied onto exposed reinforcing steel or installed into existing concrete by drilling or coring holes on a grid pattern. ACI’s Repair Application Procedure (RAP) 8 Installation of Embedded Galvanic Anodes uses the following nomenclature to define different types of anodes. So, for example of Type 1A embedded anode is an alkali–activated anode used in concrete repair to mitigate new corrosion due to patch accelerated or ring anode (halo effect) corrosion. Galvanic anodes are also used to provide protection of concrete and steel piles in a marine environment. Concrete and steel piles in the marine environment are subject to serious corrosion deterioration. For marine pile protection, galvanic jacket systems are used to provide galvanic cathodic protection for prestressed concrete, conventionally reinforced concrete and steel piles and columns. Galvanic jackets can consist of zinc mesh anodes, distributed alkali–activated anodes and more recently distributed zinc anodes in wicking fabric for direct seawater wetting of the zinc inside the concrete jacket. Fusion anodes are a hybrid system that combines the power of impressed current cathodic protection with the maintenance–free performance of galvanic anodes. Fusion anodes work with two–phase protection whereby Phase 1 delivers an intense burst of electrical current to strikes the reinforcing steel and passivates rebar corrosion similar to an electrochemical treatment or ICCP system. Then Phase 2 utilizes embedded galvanic anodes to shield the structure from future corrosion damage (cathodic prevention). This system can provide a high level of long–term maintenance–free protection. There is a range of cathodic protection options available to protect new and existing concrete structures. Each system can provide different levels of corrosion protection and cost. An understanding of the capabilities and limitations allows the engineer and owner to implement the best system for their individual concrete preservation objective. Koch, G.A, Brongers, M.P.H., Thompson, N.G., Virmani, Y.P. Payer, J.H. (2002) Corrosion Costs and Preventive Strategies in the United States, FHWA Report RD–01–156. ACI Committee 222 (1996) Corrosion of Metal in Concrete, American Concrete Institute (ACI) 222R–96, p. 237. Technical Guidelines Committee of ICRI, (1996) Guideline for Surface Preparation for the Repair of Deteriorated Concrete Resulting from Reinforcing Steel Corrosion, International Concrete Repair Institute Guideline No. 03730. Glass et al, (1999) The Protective Effects of Electrochemical Treatment in Reinforced Concrete, Corrosion, Vol. 55, No. 3, pp. 286–290. National Association of Corrosion Engineers, (2000) Impressed Current Cathodic Protection of Reinforcing Steel in Atmospherically Exposed Concrete Structures, National Association of Corrosion Engineers Standard Recommended Practice RP0290–2000. National Association of Corrosion Engineers, (1984) Corrosion Basics, an Introduction, p. 180. Whitmore, D.W, and Ball, J.C., (2003) Applications for Galvanic Anodes in Prestressed Concrete, Precast/Prestressed Concrete Institute Bridge Conference Proceedings, p. 8. Pedeferri, P (1996) Cathodic Protection and Cathodic Prevention, Construction and Building Materials, Vol. 10, No 5, 1996, pp. 391–402. Bertolini, L et al., (1996), New Experiences on Cathodic Prevention of Reinforced Concrete Structures, Corrosion of Reinforcement in Concrete Construction, SCI, pp. 349–358. 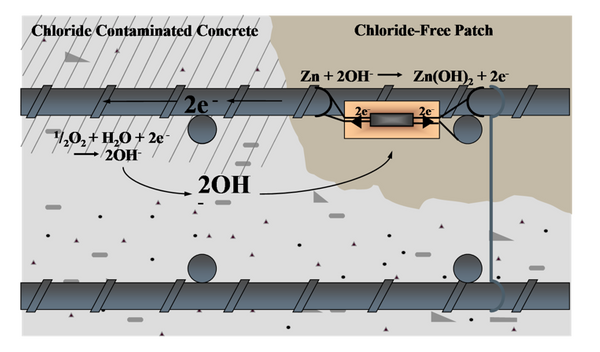 Sergi, G. and Page, C.L., (1999) Sacrificial Anode for Cathodic Protection of Patch Repairs Applied to Chloride Contaminated Concrete, The European Corrosion Conference. Bennett, J., (1998) Chemical Enhancement of Metallized Zinc Anode Performance, Paper No. 640, NACE Corrosion 98.